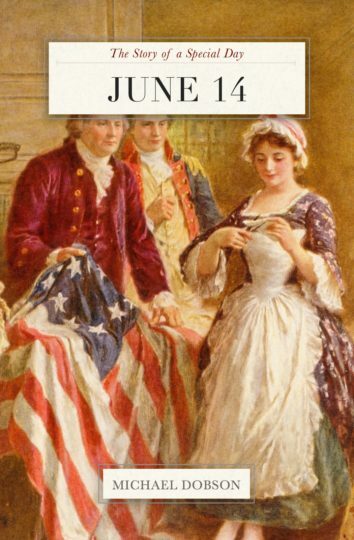 JUNE 14, 1777 — CONGRESS ADOPTS THE AMERICAN FLAG! June 14 in the United States is Flag Day, commemorating an act of the Second Continental Congress on June 14, 1777, adopting the “stars and stripes” American flag. In other news, Captain Bligh reaches safety in Timor after the Mutiny on the Bounty, Hawaii becomes a US territory, and the first successful nonstop transatlantic flight takes off. June 14 birthdays include Uncle Tom’s Cabin author Harriet Beecher Stowe, US President Donald Trump, revolutionary Che Guevara, musicians Burl Ives and Junior Walker, and tennis star Steffi Graf. Traitor Benedict Arnold died on June 14, along with composer Henry Mancini, TV pioneer John Logie Baird, and writer G. K. Chesterton. If June 14 falls on the third Sunday, it’s Father’s Day in the US and many other countries. Malawi celebrates Freedom Day and the UN honors blood donors. It’s also National Strawberry Shortcake Day, National Bourbon Day, and International Surfing Day! In astrology, June 14 is in the sign of Gemini (traditional) and Taurus (sidereal). June birthstones are pearls, moonstones, or alexandrite; June birth flowers are rose and honeysuckle. is the emerald, and its birth flowers are lily of the valley and hawthorn. Each volume of The Story of a Special Day is packed with rare historical photos and fascinating facts. With 82 pages packed with over 44 historic photographs and illustrations, this book is a feast for the eyes as well as for the brain. A perfect birthday present or anniversary gift, “The Story of a Special Day” will make anyone feel special on his or her very special occasion.